A Demonstration Farm? – Sugar vs the Reef ? 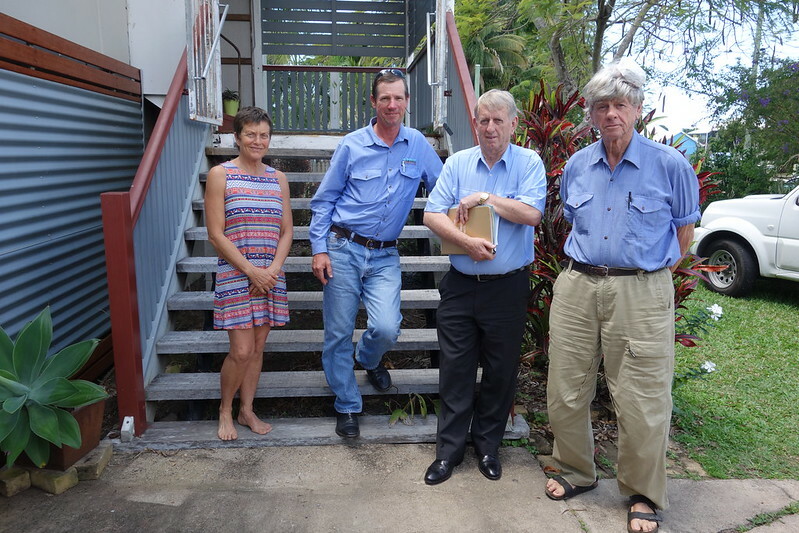 Kim, Simon, Jim, and John on the steps of our old Queenslander in West Mackay posing for a group photo after our meeting. John Sweet called up Jim Pearce, the state Labor MP for Mirani and asked for a meeting. As part of John’s vision to redesign the entire Great Barrier Reef Catchment along Keyline principles, he brings together people to catalyse that small thing which might just set something big in motion. So the fact that Kim and I are visiting Mackay was John’s occasion to “Summon the MP”. I suggested to John that it might be a good idea to invite Simon Mattsson along too. I mean, if you’re wanting to talk about farming with a pollie, it’s probably strategic for there to be a currently practicing farmer there. Even better if you can bring along a sugarcane farmer, since that’s the dominant crop in this part of the world. So we convened for morning tea in the living room of the old Queenslander house we’re staying in: the artists (Kim and Lucas); the canefarmer (Simon); the community activist and retired farmer (John); and the politician (Jim Pearce MP). We had banana bread, and tea, and a very long and meandering conversation. What I liked most about this conversation was that we hadn’t really planned out what we were going to say to Jim. Because of this, rather than coming across as a united front with a clear “message”, much of the time we were speaking to each other as much as to Jim, clarifying between ourselves our thoughts on agricultural methods and how to create social change, while Jim patiently listened on. We talked about the bleaching of the Great Barrier Reef, about soil health through plant diversity, and about the relationship between food and human health. Every now and then Jim would chip with with a question or a request for clarification, and off we’d go again. He sat with us for nearly two hours. I’m sure that for much of this time he was mildly puzzled about our strange team and this very open ended meeting. Eventually Jim drew us back together again. What was it exactly that we wanted him to do? He was looking for something tangible, something that an MP who has a farming background himself, but who isn’t an expert on regenerative agriculture could take away and consider. We didn’t have a prepared answer. We were working it out, right there in the room, live. The conversation bounced off once more. We talked about the many “top-down” government and industry programs channeling funding to create change in agricultural practices; about how these programs chop and change depending on the short cycles of who is in power, and how farmers become disillusioned with incentives schemes and threats for non-compliance. I mentioned that I was particularly interested in the work of groups like CQSHS because they embody a bottom-up approach, with farmers taking the initiative. And so an idea began to emerge. Our tangible proposal to Jim would be for the Queensland government to support the establishment of “Demonstration Farms” for sugar cane. Organised by farmers on the ground, a Demonstration Farm would need to be located in each growing region, to represent the particular soil types and climate conditions up and down the coast of Queensland. They would provide the opportunity for other farmers to come and have a sticky beak at what’s being tried out in their own backyard. Farmer-led education. As this idea rolled out, Simon put his hand up and volunteered for his farm to be the “proof of concept” for Demonstration Farms in the sugar industry. It makes sense – he’s already convening soil health field days, running trials for variations on multi-species cropping to break the monoculture, he’s already regularly hosting soil scientists for studies and talks and workshops. So the establishment of an “official” Demonstration Farm at his place would just be a formalising of something that’s already begun. The boost of resources would allow agricultural research and education on the farm to have a much deeper impact than it does now. Jim seemed genuinely pleased with this suggestion – he asked us to write up a 3 page proposal and send it to him. He would then take it to the Agriculture Minister, Leanne Donaldson. Ideally, we’d then get to have a meeting with Leanne — and it would make a lot of sense if that meeting took place on Simon’s farm in Marian. 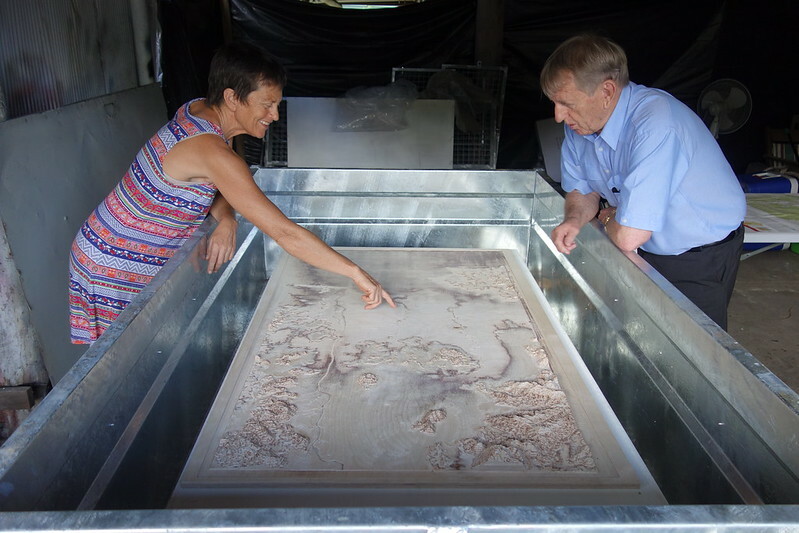 Artist Kim Williams shows Jim Pearce (MP for Mirani) our 3D plywood model of the Mackay catchment area. It’s still early days for this 3D model. We need to experiment with some data-projected layers showing land use, water flows, soil types etc to really bring this miniature landscape to life. We’re hoping that these sorts of combinations of tangible sculptural form and data visualisation will be a useful tool for discussions on farms (hence the trailer to transport the model around). Perhaps a zoomed-in version of a model like this, showing the topography of a single property and its surroundings, could be integrated into a future Demonstration Farm at Marian?